Among the 3D cell culture methods, multicellular tumor spheroids (MCTS) generated from cancer cells are attracting models to investigate the influence of malignant cell-interactions on cellular proliferation, differentiation, apoptosis and gene expression. While growing, MCTS display a gradient of proliferating cells. Proliferating cells are located in the outer cell-layers whilst the quiescent cells are located more centrally. When the central cells become deprived of oxygen and glucose, cell death and necrosis occur. This heterogeneity is similar to what is found in non-vascular micro regions of a tumor. MCTS is therefore an attractive model for studies of proliferation in a 3D model. Nevertheless, in toto spheroid studies are limited by the thickness and the density of the samples that constitute a real barrier for functional studies requiring modification of gene expression by conventional methods of transfection. Expression of specific cell markers within spheroids can be detected by immunofluorescence microscopy of paraffin-embedded or frozen sections or by using flow cytometry after enzymatic dissociation of the cells, but these methods do not allow considering the 3D organization of spheroids. 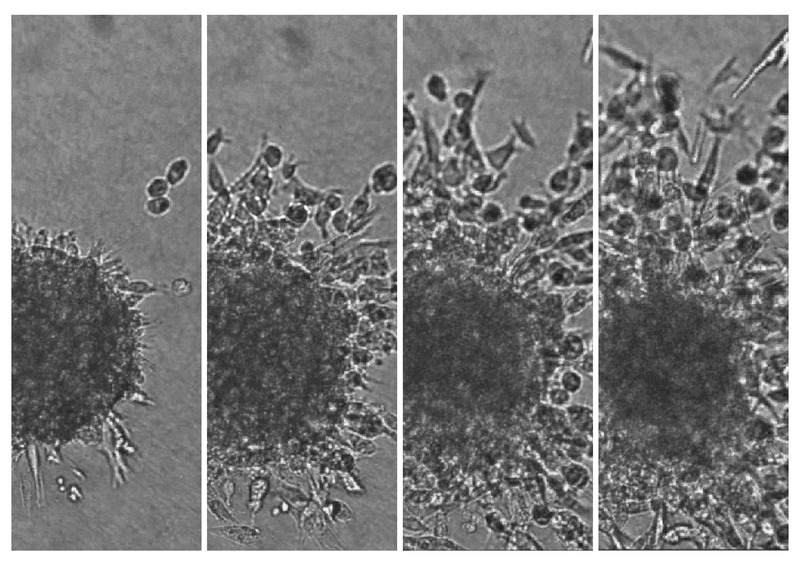 SPIM appears today to be the most promising imaging technique to perform cell live imaging inside spheroids. The development of this new 3D imaging technology will exemplify the power of genetically engineered multicellular tumor spheroid model to address important issues in the field of cancer biology. Odyssey images fluorescence specifically in the infrared region. ImageScanner III is a high-resolution flatbed scanner for imaging non-fluorescent samples. Syngene Dyversity, high resolution camera system, capable of capturing both fluorescent and chemiluminescent images and a GelCount colony counter.